I’m not related to the Morgans, but I would like to solve the mystery of where this child was laid to rest. Can you help reunite this baby with her family here or on Find A Grave? I thought perhaps it was SIDS until I saw the part about blood from the nostril. The female baby died on 3/18/1887 at 1 month and 7 days old, which would make her DOB 2/11/1887. There was a female Morgan baby born in Chicago on 2/6/1887 to Gilbert Morgan and Katherine nee Rausch. In those days, babies’ first names were usually not listed on the death cert. They also had a male child born 2/12/1886. 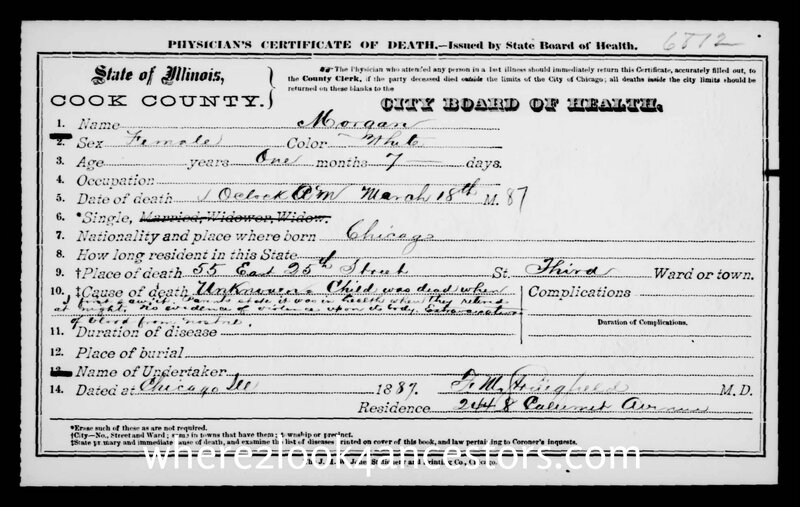 Gilbert died in Chicago 12/10/1892 at the age of 27. He was a switchman for the railroad. He was buried at Oakwoods, where I was guessing the deceased infant probably was buried because of where the Morgans lived at 55 East 25th Street. You are a rock star Jim! 🙂 Thanks for your Sherlock-like sleuthing! I love doing these – they’re like a treasure hunt. I did check the Tribune archives for any writeup on the death of Gilbert Morgan. He was a RR switchman so I thought there could have been a RR accident, but the papers didn’t have anything listed. I had an aunt that died young from meningitis and they talked about blood coming from her nostril, perhaps that’s what this poor baby had. A love of solving mysteries is definitely a helpful trait for genealogists. This story turned out to be quite interesting – thank you again for your help!